Susan Vogel lives in New York, grew up in Beirut, and has lived for long periods in a medieval city in Mali, and a village in Ivory Coast. She has published many books, and written a few, founded an art museum in New York—that survived her departure—and directed two museums. She then successfully completed two years as a MFA student at NYU's Tisch School of the Arts, and became a filmmaker. Vogel has a PhD in art history and is internationally recognized as a curator and African art expert. She has held the positions of curator at the Metropolitan Museum of Art; Founding Director of the Museum for African Art; and Director of the Yale University Art Gallery, and Professor in the Department of Art History at Columbia University. About her exhibitions, the New York Times recently said, "In the 1980s and '90s [they] revolutionized the way art, any art, could be exhibited. No one else has fully picked up that challenge since." Her last book BAULE: African Art/Western Eyes has been translated into French and received the Herskovits Prize, the African Studies Association's highest honor for original research on Africa. Her body of work was recognized by the prestigious Leadership Award of the Arts Council of the African Studies Association. 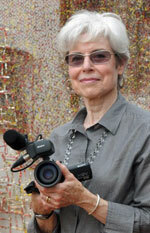 Her documentaries are filmed in Africa with African crews—several co-produced with the Musée National du Mali. With humor, an offbeat aesthetic, a scholar's grasp of the subject, and almost no voice over narration or expert interviews, Vogel's films are both personal and penetrating. The Future of Mud - This is the story of Komusa Tenapo, master mason and heir to the secrets of Djenne architecture, the traditional use of mud in Malian buildings. Malick Sidibe: Portrait of the Artist as a Portraitist - Short but sweet look at the work of the renowned African artist whose photographs have documented social and cultural changes in Mali over a forty-year period. Living Memory: Six Sketches of Mali Today - About Mali's ancient culture, and this culture's position in the country today. Exposes tensions in a society assailed by modernization, Islam and global tourism, yet confident that it will maintain its own distinctive character. Fang: An Epic Journey - Mixes documentary and fiction techniques to recount an African art object's 100 year journey - a whole century of Western attitudes towards African culture packed into 8 minutes!